I’m back in Seattle after a 10-year hiatus! I’m absolutely thrilled to be here, mostly because I’m going to a food blogger conference, and working with bloggers is the best part of my job (well, that and launching The Feed!). So in honor of this week’s event, here’s a little recap of the various blogger projects we’ve done at America’s Test Kitchen. The amount of work the Test Kitchen put into developing its very first “Menu Cookbook” was astounding. In addition to developing the recipes and menus, test cooks had to prepare an entire dinner party for 8 by themselves, all in one go, while timing the process and watching for things like stovetop space, changing oven temperatures, and dish pairings. So, we were excited to put the book to work. 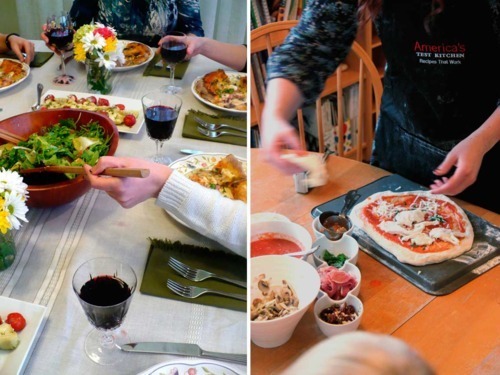 We asked bloggers to host an America’s Test Kitchen Dinner Party in their home. Click to see our kickoff and application post. $200 in cookbooks to give to dinner guests, an America’s Test Kitchen apron and a feature on The Feed. Six kickass blog posts by six amazing bloggers all across North America. This included Sara Wells of Our Best Bites (Idaho), Candy Wong of Dessert By Candy (Ontario), Jen Perez of Beantown Baker (Massachusetts), Megan Pence of Country Cleaver (Washington), Sarah Kieffer of The Vanilla Bean Blog (Minnesota), and Stephanie Eddy of Clockwork Lemon (Alberta). We had already gotten to know some of the bloggers, like Candy Wong, through Twitter and email, but this was a really great opportunity to work together on a fun project. It was all about community! Usually blogging is a solo activity, but because this project was all about spending time with family and friends, every blog post celebrated the community of people that surrounded the blogger. The editors and test cooks who made the book were absolutely thrilled to see the posts. After all the work they had put into the book, they were excited to see the recipes being used in homes across North America, and to hear that the dinner parties were a success! You got to hear about the dinner party disasters! From left-out ingredients to wrestling with a pork loin, the bloggers weren’t afraid to share with us mistakes made — this wasn’t a polished, boring PR piece by any means. Our social media intern, John Sandala, was the official “host” of the entire project, and not only did he do an incredible job, he also said that he learned a lot from the experience. When we launched the America’s Test Kitchen Cooking School, we couldn’t wait to get food bloggers on board. We had already put one of our Social Media Interns through the school, and from the feedback we’d received from our existing students, it seemed like the perfect project for a dedicated home cook who wanted to pick up more skills. We asked bloggers to apply for a cooking school scholarship, and the blog scholars would be asked to write one blog post on a specific course. A personal phone call with TV’s Bridget Lancaster, access to a Test Kitchen instructor, and a 1-year enrollment in our Online Cooking School (worth $500). It’s still in progress, but we have five scholarship winners, and they’re working their way through their blog posts. The winners included Susie of We Are Not Martha, Cynthia of Deep Thoughts by Cynthia, Brooke of Crackers on the Couch, Truc of Treats SF and Darla of Darla Cooks. The winners of the blogger scholarship got to meet Bridget Lancaster over the phone and get personalized advice from her as part of their “enrollment process.” That was seriously cool. The bloggers made terrifying-sounding techniques less terrifying. 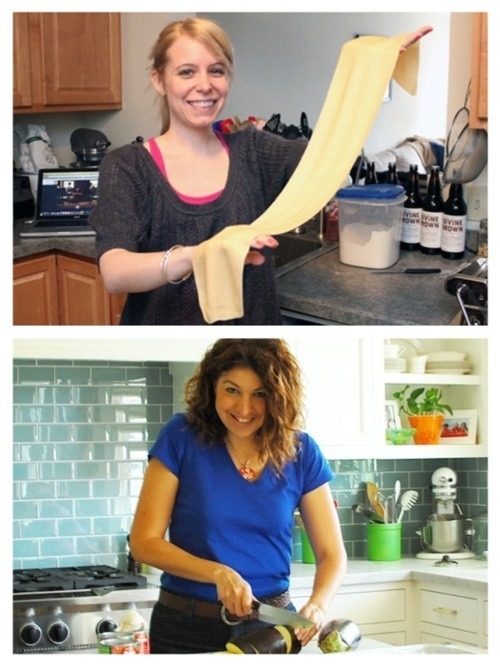 For example, after reading Susie’s post about learning how to make homemade pasta, I borrowed a pasta maker, went home, and made my own pasta. Their posts made me feel like I could cook anything. The bloggers really made the cooking school their own. Brooke from Crackers on the Couch is absolutely hilarious, and she told the story of the cooking school in an entirely new way. And when she succeeded in making awesome dishes, we cheered. They energized the cooking school community. As a new product, the cooking school’s “Student Lounge” section was pretty quiet, and it was great to see the blog scholars on the discussion boards, helping each other out. 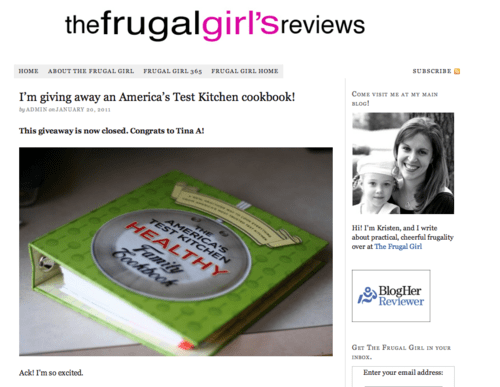 This was my very first blogger project, hosted a few weeks after I had started working at the Test Kitchen. The bloggers I worked with were incredibly warm and welcoming, even though they had no idea who I was. I also learned a ton about how to manage the logistics and ethics behind giveaways. In celebration of our brand new Healthy Family Cookbook, we hosted a “virtual book tour,” with 5 different blogs giving away a copy of the book, Monday-Friday. 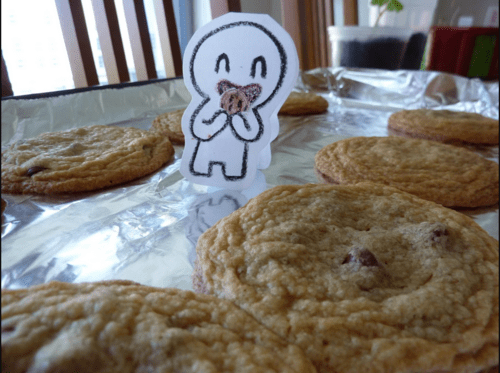 Baking Bites, Gastronomy Blog, The Frugal Girl, Annie’s Eats and Steamy Kitchen. Excitement from the community that we were finally going to reach out to bloggers, and roughly 3,500 comments across 5 blogs. As my first blogger project, I spent a lot of time reading and researching blogs. Once I had selected blogs that I thought would be interested in working with us, I cold-emailed the bloggers. I wrote personal notes to each one, and all 5 bloggers that I emailed were excited to participate. 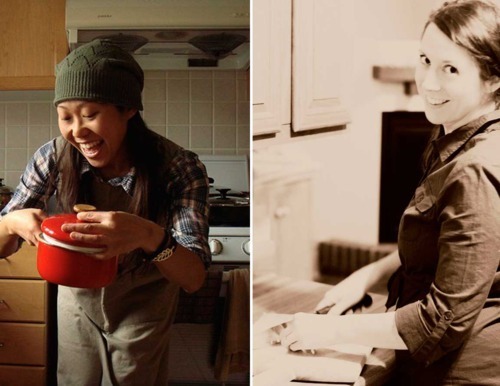 It gave me the opportunity to meet my first food bloggers, and chat with them on the phone! I’ve since become friends with many of them — Cathy from Gastronomy Blog just stopped by the Test Kitchen and hung out with us last week. I quickly discovered that working with food bloggers would be the best part of my job! We film the TV show for 3 weeks every year in May, and about 10 days before filming was going to start in 2011, I was told that I could invite a blogger onto the set. So, in about 2 hours, I put together this contest. 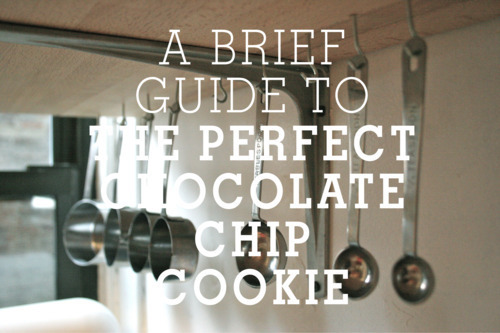 Blog about making our Perfect Chocolate Chip Cookie recipe. (Here’s the kickoff post.) The tough part: You had to be in the Boston area, and this had to be done in 10 days. Talk about last minute. We would pick a winning post, and the blogger would come visit the set of America’s Test Kitchen and meet our cast. Roughly 40 bloggers sent in submissions, which completely stunned me (I was expecting more like 5 or 10, considering the tight deadline). See the submissions here: part 1, part 2, part 3. The creativity. 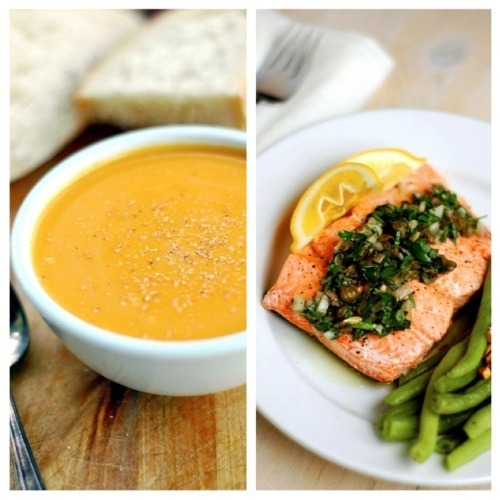 It was the same recipe, but everyone wrote about it in a completely different way. Engaging the local blogger community in Boston. We had never reached out locally before, and it was really great to meet bloggers in our own city. I got to assemble an internal panel of judges — from the marketing, editorial and sales teams. It was a great excuse for cross-departmental collaboration (and they all got cookies afterward!). We also loved so many of the submissions, that while one winner got the opportunity to visit the Test Kitchen during filming, we invited everyone who submitted a blog post to tour the Test Kitchen after filming. I took about 30 bloggers over the course of three days on a tour of our studio and offices — it was so much fun to be able to invite fans into our Test Kitchen. Here are their recaps of the tour. Now I gotta go head down to BlogHer Food! I’m excited!